dnagolf » Who "Drives" Your Brand? We all know how brutally hot Phoenix can get in the summer months of June, July, and August. The heat makes it near impossible to organize a full scale corporate/charity golf tournament. So bring your tournament indoors! DnA Golf’s portable golf simulator is available for local Arizona events and it can be the hit of your next charity or corporate golf event. Create an indoor skills challenge with closest to the pin and long drive contests. Entertain your guests with a hole in one contest on the 7th hole of Pebble Beach. Unlike a traditional golf tournament, where you spend most of the day getting to know only 3 people, an indoor skills challenge allows group networking throughout the entire event. With a typical event being 3 hours, it is less of a time commitment for your guests. Contact us if you are interested in hosting an indoor Arizona Golf Event. 1. Keep Business Talk To A Minimum On The Course. Remember, your focus should be about building a relationship… not seeing how fast you can close a sale. If you invited someone out for a round of golf, chances are that the potential clients or customers are there to play golf and enjoy the day. 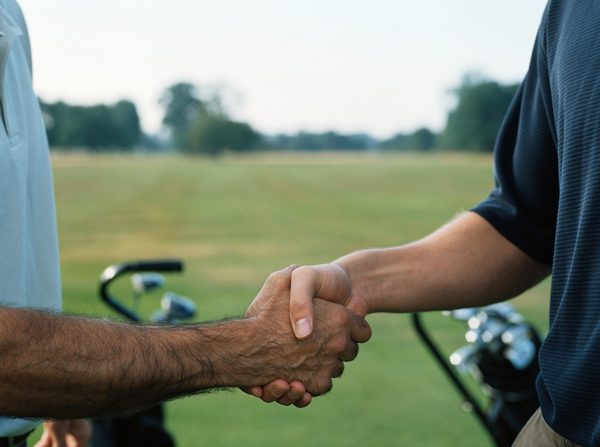 Bombarding your guests with too much business talk right out of the gate will make for an awkward round of golf. If the conversation happens to organically evolve into business then try to keep the conversation about them. Keep things brief so you don’t delay the game. Ask questions, develop discussions and above all relax and enjoy the round. 2. Make Plans For The 19th Hole. Your best opportunity to discuss business is after the round. Invite your guests out for some food and drinks. Choose a convenient location. Often times the course restaurant is best. It will give you a good chance to talk business in a relaxed non-confrontational atmosphere. This puts your guests at ease. They will be more comfortable knowing that they are free to leave at anytime. The 19th Hole will offer you an opportunity to discuss business, but more importantly offers you the chance to get more acquainted. 3. Know Your Skill Level. You don’t need to be an exceptional golfer to play business golf. It is a game of developing relationships not competitiveness. The handicap system is put into place to help level the field. There are methods of play, such as a scramble, where you can still contribute even if you are not an outstanding player. The most important thing is to not slow down the game for other players. Avoid taking too many warm-up shots and don’t spend too much time searching for a lost ball just to save yourself a stroke. Likewise, if you are an avid golfer playing with a beginner, try to be patient and encouraging. Playing in charity or corporate scramble tournaments is an excellent way to gain experience while playing a casual game of golf with people of all skill levels. 4. Be Prepared. Study the course; not necessarily to improve your score but so that you can provide your guests with information about the course should they ask. Make sure that the course you select is good for you and your guests. Make sure to bring business cards and have additional marketing materials ready… even if you leave them in the car. You don’t want to push these materials on your guest but it is good to have them handy if they are requested. 5. Pay For The Round. If you have invited someone out for a round of golf it is common practice that you pay. Prior to your guests arriving, be sure to let the golf shop know that you are picking up the green fees for your group. It will make for an uncomfortable scenario if there is any confusion on the who is paying so be sure to plan accordingly. 6. Seek Results. By results I don’t mean your score. Spend some time beforehand thinking about what you hope to accomplish during your day with your potential clients or customers. Write down a list of goals and systematically figure out how you are going to execute them throughout the day. Think of how you might be able to help them. Are there people that you know in their industry? Are there contacts in your network that might be helpful to them? Offering them something of value (for free) is an excellent way to make a first impression. 7. Remember That The Game Provides Insight To Character. This may seem obvious but the entire round is a reflection of your character and business. Be punctual, dress professionally, drink in moderation (or not at all), and know proper golf etiquette. If you accidently move the ball, call a penalty on yourself. This will build trust and let them know that you are a person of integrity. In the eyes of a potential customer, a dishonest golfer always translates into a dishonest businessman. Don’t lose your temper. You can hone in your golf skills with your buddies over the weekend. Your guests will probably not remember your misses, but they will take note of how you react to those misses. 8. Be Adaptable. Pay close attention to the personality of the golfer with whom you are playing. If the golfer is serious about the game then act accordingly. If your guest is lighthearted and casual then try not to take the game so seriously. Be a good judge of character and always adapt to make them feel more comfortable. It is important to adapt and roll with the punches. It is also imperative that you remain true to yourself and display your own personality accurately. Portraying yourself as something you are not, will reflect poorly on you later. 9. Don’t Tank. It You should never intentionally lose to your guests. Always play fair and be true to your own skill level. Intentionally losing can be insulting if your guests catch on to your actions. If you end up winning, and your guests are upset, then you’ve clearly missed the objective… which was to provide a fun day and develop the relationship. The handicap system is put in place for a reason, so that golfers of various skill levels can still play a round together. Compliment your guests when they have a good shot, play at your own skill level, and make sure they are having a good time. 10. Follow Up. Be sure that you follow up after the round is over. Let them know that you had fun and appreciated the opportunity to get know them better. Send them an invite to LinkedIn, a thank you note, maybe even a gift depending on the relationship. The important part is to take an additional step in solidifying the relationship. 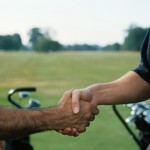 Just as a round of golf takes time, so does building solid professional relationships. DnA Golf is proud to have Scottsdale-based Hot Stix Golf as one of their distribution channels. Hot Stix Golf carries all of DnA Golf’s drivers (such as the detachable-face driver the Alpha 610 as well as the conventional welded-face designs). Hot Stix Golf uses their state-of-the-art performance center to custom fit individual golfers who purchase DnA drivers or for DnA Golf’s corporate customers. “The DnA drivers make very good use of technology that is easy to see and that is something golfers always love. Now with the affinity licensing it just made perfect sense to make them part of our fitting system and offer all DnA models to our clientele,” said Mike Helfrich, General Manager Hot Stix Golf. DnA Golf’s unique market niche focuses on creating custom drivers for corporations, colleges and car brands, where customers become affinity marketing partners and the co-branded drivers from DnA Golf help these partners build brand loyalty and awareness…with a memorable connection to golfers. This “co-branding” started with the Alpha 610 Driver through the integrations of a custom logo golf club on the crown of the club and has evolved to additional customization with heads, shafts, grips and head-covers all color matched to the unique colors of each corporation/brand or college team. DnA Golf’s revolutionary custom golf driver was in development for over 7-years and began in 2002 when BMW asked DnA Golf’s parent company, VyaTek Sports, if they could design a driver worthy of their “Ultimate Driving Machine” tagline. 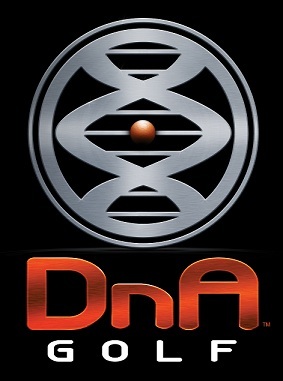 Both the DnA Golf company and product were launched in September of 2009. DnA’s Alpha 610 driver, which can optimize distance and acoustics through detachable-faces, elastomeric face inserts and variable swing-weight screws, officially conforms with USGA Rules as of an April 15, 2010, when DnA Golf received the official ruling letter from the USGA. This ruling was the culmination of discussions with the USGA, which began informally more than 2-years before the ruling. The formal submission/discussion process took nearly 6-months, which was longer than normal because DnA’s driver is so different from the conventional “norm”. The technology behind this driver is patented, so DnA Golf is the only company authorized to sell detachable-face drivers. This feature helps golfers gain distance by selecting the optimum face for their unique swing. The technology also allows customers the option of selecting from three distinct sound or acoustic profiles …loud (A1), medium (A2) and quiet (A3). Each DnA driver also includes a custom logo tastefully integrated into the crown of the club. The technology allows the creation of drivers with customizable Distance & Acoustics (DnA) the two criteria most critical to driver performance. This level of customization (distance, acoustics and co-branding) has never been available before in a driver and therefore each DnA driver carries its own unique DNA. Introducing the world’s first high-performance promotional golf driver. DnA Golf’s Private Label Drivers are perfect for golf-centric companies seeking a premium promotional product that delivers long term exposure and lasting value. DnA Drivers can be fully customized with the customer’s colors and graphics. Custom logos can be added to any 1 of 6 unique logo positions including the shaft, grip, head cover, driver crown, driver toe, and driver sole. DnA Drivers are suitable for large corporations or small businesses. Fully customized driver designs can be cost-effectively made for corporate partners in very small quantities, as few as one driver. They are the perfect gift to present to your best customers, partners, or employees. DNA Golf is a wholly owned subsidiary of VyaTek Sports, Inc. © 2011 DNA Golf. All rights reserved. Powered by Eden Design.